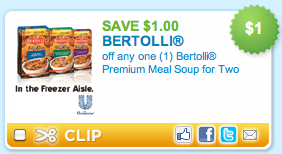 Printable Manufacturer's Coupon: Enjoy $1 on any one Bertolli Premium Meal Soup for two. Hurry and print our "hot coupons" before they're gone and save them for later use. The coupons may be available now and may be gone tomorrow. 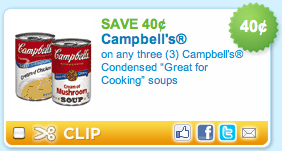 Printable Manufacturer's Coupon: Enjoy $.40 on any three Campbell's Condensed Soups. Hurry and print our "hot coupons" before they're gone and save them for later use. The coupons may be available now and may be gone tomorrow.